As the new industry of space tourism begins its rapid expansion phase with the introduction of Sir Richard Branson’s Virgin Galactic spaceflights around end 2010/early 2011, the reader of this book will gain an understanding of how it reached this point. The story, told through a well-selected collection of photographs, is of a succession of developments and risk-taking that goes back a century to the almost simultaneous start of both aviation and rocketry. The key people in this story are highlighted - and are given “The Wright Stuff” Awards - for their contribution. Many of them are surprising, in that they would not previously been associated with space tourism, but the author makes their contributions clear. 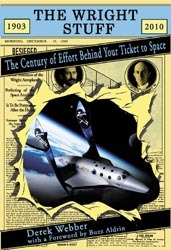 Readers will learn that their tickets to space have been made possible not just by the efforts of entrepreneurs and engineers, but also just as importantly by artists, regulators, politicians and some of the earliest aviators – all of whom had “The Wright Stuff”.